Rare caucasian design wool area rug with four-cornered ivory motifs. Very intricately hand woven and detailed pattern. Suitable for a sitting area with rustic d̩cor. Handmade exclusive Caucasian design rug with ivory motifs. A single-layered intricate border with a diamond medallion in the center. Will be shipped the very next day of an order placed. 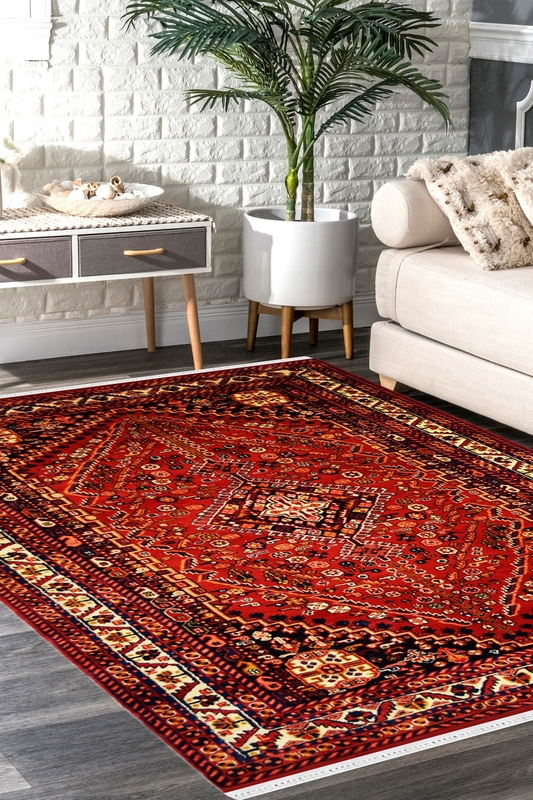 This Hand-knotted Rug is weaved by skilled artisan weavers in Finest Quality 100% New Zealand Wool. The Design is reminiscent of a small town in Persia and is woven by our talented weavers. Primary colors of this rug are Rustic Red ivory and blue. The Border has intricate pattern surrounded by tiny floral design pattern. All of our hand-knotted rugs are professionally washed and treated. All rugs are individually inspected before leaving our warehouse.